A new slide to bring new thrills and excitment to your party! 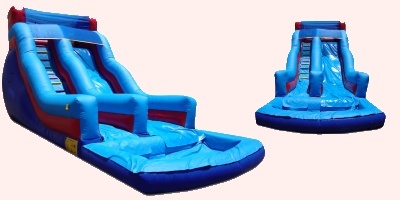 This 18 foot double drop slide gives you fast fun with a kick it is a bit bouncy as you pass over two humps. You must have a oversized gate 48″ or larger for all slides over 18′ These slides do not go up or down stairs and must have a reasonably flat and clear access to the setup area. Slides up to 18 foot are moved to final location by a dolley. If the Dolley and 500 to 1200 pound castle can not roll easily to the destination your delivery will be canceled. No slide will go over a wall, no slide will go up or down steps. If you book a slide and do not have access to deliver there will be at least a 50.00 or more cancellation fee depending on the slide. Our delivery driver will make the determination of deliveribility with the safety of himself, your family, and the slide as the guidelines. JumpMaxx prides ourselves in providing America with newer, cleaner, high end entertainment with inflatables like the 18″ Double Drop and many others.